To improve practices and support in the area of digital preservation, the Scientific Open Access Repository of Portugal RCAAP has carried out a worldwide pioneering audit (of about 26 Portuguese repositories) that shows trustworthy preservation of digital objects. The Scientific Open Access Repository of Portugal (RCAAP) mission is to promote, support and facilitate the adoption of open access (OA) to scientific knowledge in Portugal. The Scientific Open Access Repository of Portugal (RCAAP Project), operated the Foundation for Science and Technology (FCT) - FCCN, and with scientific and technical support from the University of Minho, aims to increase the visibility, accessibility and dissemination of national scientific production and to integrate Portugal into a wide range of international initiatives in the OA domain. At the end of 2015, RCAAP concluded an audit aimed at assessing the compliance level of SARI repositories (Institutional Repositories Hosting Service), with the reference standard ISO 16363:2012 - Audit and certification of trustworthy digital repositories. 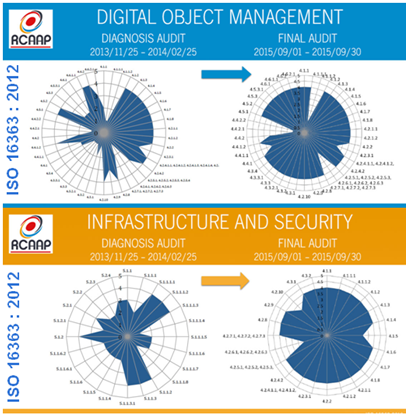 The audit grew out of a need identified in 2012 by the RCAAP project team to improve practices and support in the area of digital preservation, and to cope with increasing responsibilities regarding the legal deposit of theses and dissertations, and support for the implementation of the FCT’s Open Access policy. On September 15, 2015, the ‘Technical Regulation of Deposit of Theses and Dissertations’ was approved, which requires the deposit of a digital copy of all theses and dissertations into a repository of the RCAAP network. The FCT’s Open Access Policy, approved on January 16, 2014, which applies to publications funded since May 5, 2014, mandates the availability of the scientific results through the Internet, openly, and without costs to the user. To that end, the above mentioned internal audit was carried out in order to ensure that all stakeholders have confidence in the services being developed. The audit assessed the level of maturity of the repositories of the SARI network, across three dimensions in two phases: (1) Organizational Infrastructure; (2) Digital Objects Management and Infrastructure, and Security Management. In the 1st phase (a preliminary audit), repositories managers undertook an organizational infrastructure self-assessment exercise (for each requirement of the ISO 16363:2012) using a scale between 1 and 4. The results showed that the repositories had an average rating of 2.1. In the 2nd phase - following an analysis of all the information and adopting new recommendations - the SARI service increased its level of compliance with the standard requirements, from 2.8 to 3.7 for the dimension of Digital Object Management (section 4 of the standard ISO 16363). With regard to the requirements relating to the dimension Infrastructure and Security Management (section 5 of the standard ISO 16363), the repositories (integrated into or hosted by the SARI service) increased their level of average compliance levels from 2.6 to 3.8. In the final audit, the repositories improved ratings to an average of 3.4, thus revealing a high level of compliance with standard requirements and demonstrating to be well developed in terms of infrastructure as well as reliability and security (as key features) for the preservation of digital objects. In addition to SARI service, the RCAAP project has been extended into other services (e.g., the Scientific Journal Hosting Service SARC and the research data repository) to better serve the Portuguese scientific community. Are you aware of any use case where conformity with ISO 16363 adequately addresses relevant digital preservation requirements? We would be interested to hear from you here!